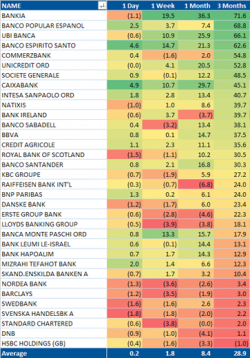 Over the last 3 months, every bank in Europe has outperformed the MSCI World Index, some by 50-70%. Two-thirds of the companies sell for below book value. A New Range For TIPS Yields? Even after the non-taper and government shutdown, TIPS yields are holding at an elevated level relative to recent trends. Have TIPS yields reset to a new range? Over the last month, the European telecom, utility and financial sectors have been the leadership groups within the MSCI Europe Index. Interestingly, these three sectors are the highest yielding sectors in Europe. Stock performance seems to reflect the strength in the Euro/USD. We often group stocks into either cyclical or counter cyclical baskets based on their GICS sector, and then measure the attributes of each group. The below chart shows the 20 day volatility of the counter cyclical basket of stocks relative to the cyclical basket. Quest Diagnostics estimated today that their 3Q EPS will be below analyst expectations. This has sent the stock lower in light of the rally today.